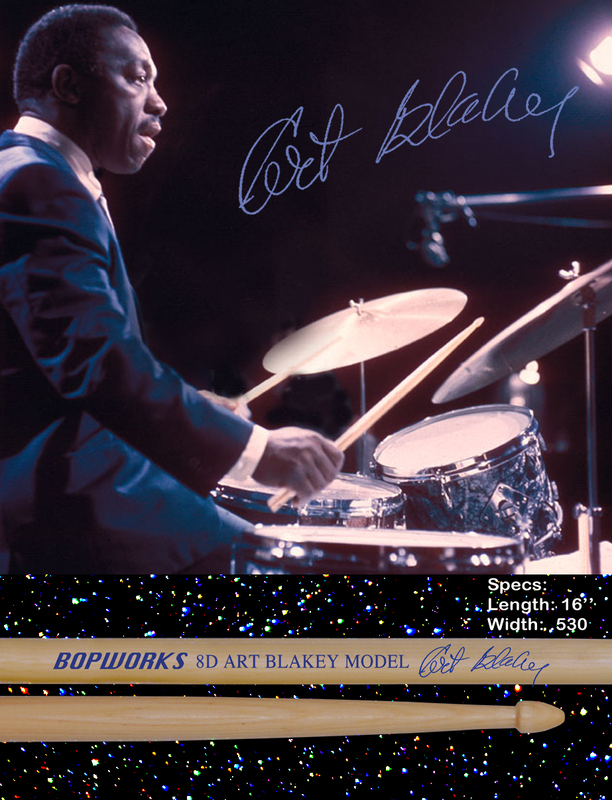 The Art Blakey signature model stick. One of hard Bop's greatest exponents, master of the smokin' press roll of death. stick ideal for almost any application. Every Bopworks stick is weighed in grams instead of ounces. This ensures proper matching in every pair you buy..
As always, great sticks & great service! I've got rhythm, music, and my gal, and now I've got drumsticks, too! Not only did they arrive promptly and are attractive, good looking, and nice to peruse, they work! I think these will be the sticks I "stick" with for awhile. They feel great and they have some power behind them. Drums are solid tones and cymbals are dark and lovely. I will definitely buy a few more pairs. Thanks Bopworks! 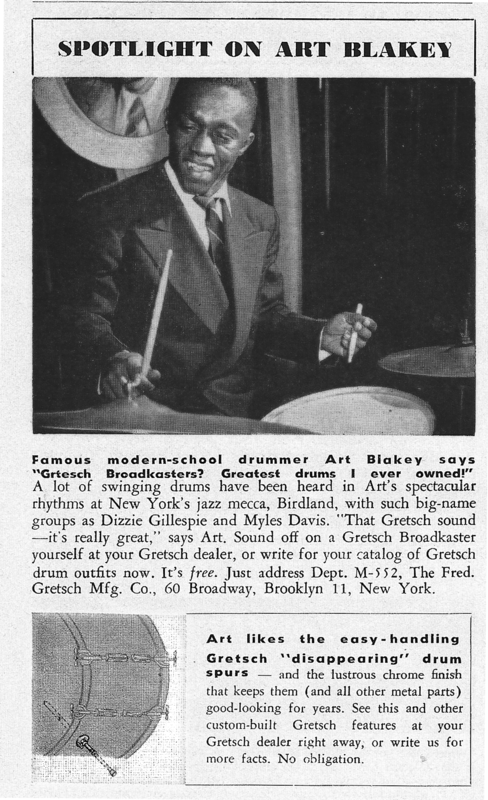 At first glance the Art Blakey stick can be intimidating with its large triangular bead. Fortunately, playing is believing. The rebound off cymbals is remarkable, even on thinner, lighter cymbals! The bead isn't overpowering but very articulate, making even thinner cymbals, with a lot of wash, have a decent attack or stick sound. Wonderful big band or quintet stick. You don't have to "work" this 8D, it works for you. It's milled very finely, has a beautiful finish and feels great! Can't say enough about this one. Another of my favorites! By the looks of the triangular bead, one would think that these sticks produced a harsh attack on the ride cymbal. Not at all! Instead the stick produces a bright clean attack while giving the player perfect balance in the hand. This is a great big band and general purpose stick! I think these Blakey 8Ds are the stick I've been waiting for! They are full enough in the grip to not feel like twigs, but the long taper keeps them fairly light and nicely balanced. The big triangle tip sounds clear and articulate on cymbals and produces a big, full sound on drums - the perfect balance between a lighter "jazz" stick and something more widely applicable. They are extremely well made, solid and durable. I've had one pair on 4 gigs and a number of practice sessions, and they've not chipped or worn down, and I'm playing more than jazz with them. The only downside is the price. I´m amazed for the quality of these sticks and the rest of the stock of Bopworks, great material, great sound and flexibility.